When working with the OpenInsight OEngineServer windows service it's often useful to run it from the console in debug mode to catpure any messages displayed by the engine or view the debugger window. Below is a BAT script you can save and run from the root OpenInsight directory on the server where the OEngineServer windows service is installed. 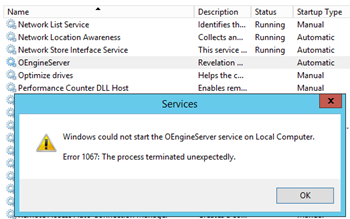 It stops the running OEngineServer service, starts the service from the console, and then re-starts the OEngineServer service. ECHO Press CTRL+C to end debug mode. ECHO Continue running script to restart engine or close to keep engine off. REM For use when Java is not in %PATH% or is the wrong version. Long time network sysadmin with proclivity to coding. Why do something twice when it can be scripted once? With a wide range of familiar technology skills Jared tries to apply the best aspects of each technology to projects leaving them better than they were before. Congruity Service is a technology solutions company bringing the best technology solutions to OpenInsight projects, Drupal sites, servers, networks, and your technology needs. Questions have many answers but usually only one right answer. I'm currently seeking questions in need of an answer for blog post topics. Tweet @TheCongruity, contact me, or call with your question. © Copyright 2016 Congruity Service LLC. All Rights Reserved.